The Friday Night Charity Darts League welcomed The Sports Argus Charity Darts Team for their annual match at Rugby Workers Club on Friday, April 5. A big thank you and well done to all players and supporters on both sides. Whilst the Rugby team lost the match 6-3, the big winners were the charities supported by Sports Argus, as the FNCDL supporters raised an amazing £2,060 - as shown by Jayne Chambers presenting Sports Argus Captain Andy Hutchinson with the confirmation poster. Thank you to all of the FNCDL players and supporters for raising this money through sponsorship and raffles. Thanks also to work behind the scenes from Mary Baker, Linda Collins and the Rugby Workers Staff. This is always very much appreciated by the league. The Knock Out draw was completed also on Friday, with Hayley and Charlie Malin carrying out the draw. 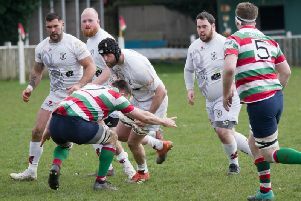 Knock Out Round 1 to be played on Friday, May 24 is: The Webb v Prince of Wales, Newboldys v Crown Avoners, Loony Moonies v Bar 8, Crow Pie v Rugby Railway Club. The Committee’s first meeting will be on Sunday, April 28 at the Workers, 1pm.